The team at SMA prepared and served the King & Queen of Spain lunch last week. DAYTONA BEACH, Fla. - Sept. 27, 2015 - PRLog -- Six Stewart-Marchman-Act Behavioral Healthcare (SMA) staff and their chef’s prepared and served the King and Queen of Spain during St. Augustine’s month-long 450th anniversary celebration. St. Augustine was the last stop on King Felipe VI and Queen Letizia's trip before they traveled back to Spain. Due to security reasons, they were not permitted to tell anyone until after the lunch, and all were required to obtain background checks. 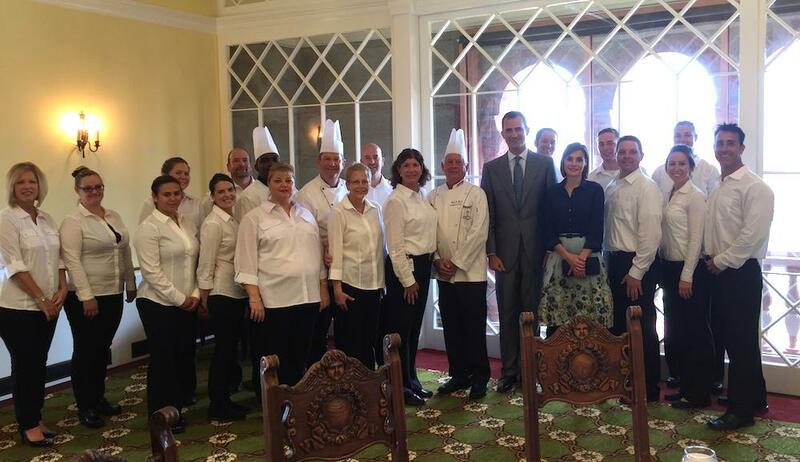 "We were honored to be selected to prepare and serve King Felipe VI and Queen Letizia lunch at Flagler College in St. Augustine College," said Ivan Cosimi, SMA’s CEO. "With the talent of Chef David Bearl overseeing the delivery of food service at SMA, and conscientious staff like Kevin Gallagher, Alicia Vincent, Carolyn Sentelik, and Kelly Bazanos doing their part, our clients are treated like royalty every day," he added. The chefs that prepared the food were SMA’s Chef Kirk Kief, Chef Kevin Gallagher from WARM, and University of Florida Chef David S. Bearl. The SMA staff that served the King and Queen were Rhonda Harvey - Vice President for Residential and Crisis Services at SMA, Carolyn Sentelik – Stewart-Marchman-Act Foundation’s Director, Ivan Cosimi – SMA’s CEO, Kelly Bazanos – Executive Assistant to the CEO, and Alicia Vincent – Director of WARM. The last visit by Spain's monarchs to the city was in April 2001, when Felipe's parents, King Juan Carlos I and Queen Sofía visited St. Augustine. The royal couple’s tour of St. Augustine during this visit included the Cathedral Basilica, which was the first Catholic church on the American continent and was given the first money by the Spanish crown in the 1790s according to Father Tom Willis. SMA Behavioral Healthcare has been serving the northeast Florida community with mental health and drug treatment services for over 50 years. SMA provides more than 35 mental health and substance abuse programs, providing prevention, diversion, intervention, and treatment services, delivered to diverse client populations Flagler, Putnam, St. Johns, and Volusia counties.